Also would make a great low table platter. 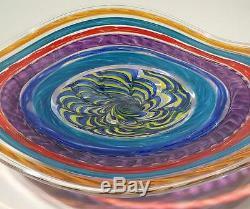 Hand Blown Glass Wall Bowl or Table Platter. "Very Complex Piece - Using both the Italian Incalmo and Cane Processes". Width: 19" Depth: 3¾" Description. 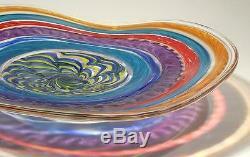 This stunning hand blown glass wall (or) table platter has shades of gold, aquamarine, red, blue, purple and lemon yellow. Making this piece was quite complex - involving the Italian processes of incalmo and cane. 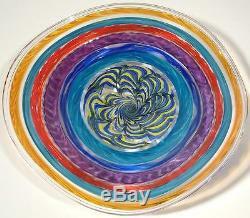 Each color section of the piece was made separately and was added one at a time while the glass is hot. One mistake while making this piece would result in all the work ending up on the floor in pieces. The red section in this piece is very bright red (red is the hardest color in hand blown glass to achieve). 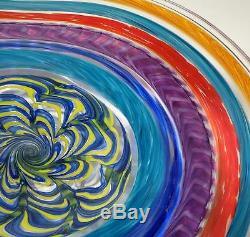 The purple section and the center yellow and blue section were created with glass canes. 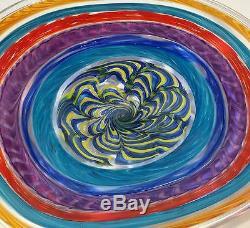 There are a total of 7 color sections and several clear sections in this piece of glass. It would make an excellent centerpiece for your dining room table. This work is in perfect condition and has no chips, cracks or any structural defects. This piece is very stable and will not wobble at all. It has been signed and dated on the bottom. Sent along with this piece comes an artist picture and bio. This is a great opportunity to own a very unique and beautiful piece of art and help out a new artist at the early stages of a career too!!! Thanks for looking and good luck!!! If "signature required" does not work for you, PLEASE LET ME KNOW WHEN YOU PAY. 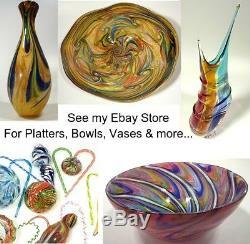 My name is Darren, and in 2005 I began my own glassblowing workshop and company called Dirwood Glass. For the past decade, I have been sharing my passion for glass through exhibiting art at museums across the nation, creating and collaborating with companies as prestigious as Ferrari (you can see some of the photos below), as well as creating unique art for individual collectors. The most recent leap in my career, has been creating a mobile glass furnace, which has enabled me to share my passion for the art and process of blowing glass outside of the studio, and into the world. The Ferrari of Glass Is Right Here On. 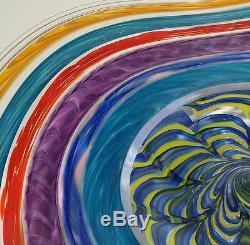 He was first introduced to the glass blowing process at college. A graduate of Bowling Green State University, Goodman apprenticed under glass master Leon Applebaum in Corning, New York. He has also studied with studio glass legends Dante Marioni, Lino Tagliapietra and Davide Salvadore. 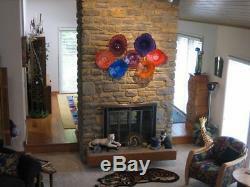 In 2005 the young artist established his own glass studio in Waynesville, Ohio. Two years later Ferrari North America commissioned him to create trophies for the International Challenge Races. A teacher as well as an artist, Goodman has coordinated classes for students at elementary and high school levels. His work has been exhibited and shared with audiences throughout the World. 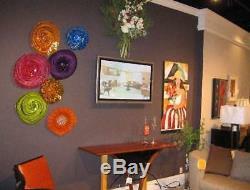 He specializes in installations, vases, bowls, and and is available for custom projects and commissions. 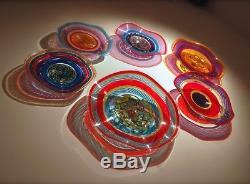 The item "HAND BLOWN GLASS ART WALL BOWL PLATTER, DIRWOOD, MURANO INCALMO & CANE PROCESSES" is in sale since Saturday, May 27, 2017. Size: Width 19" Depth 3.75"